Ascending Butterfly: 'Slip Into Summer' - Win a Mrs. Smith Bag! NOTE: There are great giveaways active on the upper right hand side of the page! Watch for the next bag in the ‘Slip Into Summer’ series to launch SOON. As you all know we have been hosting reviews & giveaways of both emerging and designer handbags this year since Spring. The feature began as 'Spring Into Bags', but now that it is officially summer we have changed the feature name to 'Slip Into Summer' instead. The expanded feature will include shoes, jewelry, accessories, AND Bags! The winner of our last bag, Camenae's Siren Mogano Leather Bag Giveaway, can be found by pressing HERE. While I'm not a mom, many of my friends are and I know many of you are too. I've had an amazing opportunity to feature a variety of outstanding leather bags. They are my passion next to travel and it's made this feature that much more fun for me. But many of you asked for non-leather bags, vegan bags, and cruelty-free alternatives in the feature. And I am beyond happy to oblige. Especially with a bag that understands that function doesn't have to mean lack of style or form. 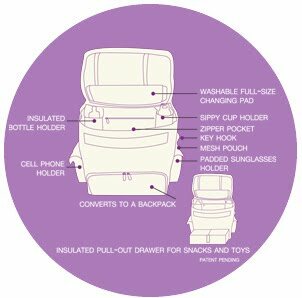 The biggest complaint I hear from many moms and from most women who commute daily with larger bags or totes is that a lot of 'roomy' bags all have the same caveat, it's hard to find anything that sinks to the bottom. Thanks to the unique design of Mrs. Smith's bags this is no longer an issue. The 'shelf' on the bottom is by far my favorite feature in this bag. It easily slides in and out so you can find things faster and easier. It's pure genius! It allows moms to use this shelf to put food, snacks, pacifiers, all those things that normally get 'lost' within the bowels of large tote bags, and be able to retrieve them effortlessly! 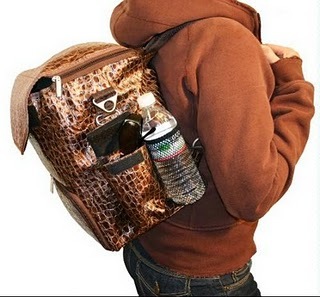 Now for us non-moms, this is a perfect bag for summer outings, park, beach, zoo, amusement parks, etc. And I personally love this as a daily commuter & lunch bag. Now this is how you SHOULD 'brown bag' your lunch! I can assure you no more smushed sandwiches for lunch. Did I tell you that this bag also converts into a backpack? Perfect for when you need your hands free. And most moms would say they always need their hands free! And as this is dads & grads month at Ascending Butterfly I wanted to let you know that they now have bags for men too! I also love the exotics in the new 'Elite' Collection of Bags, very stylish! Don't you just ♥ Mrs. Smith's Bags? Ƹ̵̡Ӝ̵̨̄Ʒ - How to Win: (1) You must be a PUBLIC follower of Ascending Butterfly to be eligible for this and all giveaways. Indicate in your entry that you follow (if your 'comment name/user id' differs from your profile id, please let me know what name you follow under) and (2) Visit Mrs. Smith's Bags and pick the bag & pattern you would select if you won and leave the LINK to that bag in your comment entry! (You will receive a bag based on available inventory chosen by Mrs. Smith's Bags) (3) You must also leave your email address somewhere in your comment. (You can format it this way for security, example: ascendingbutterfly AT mail host DOT com). (If your email is clearly visible in your profile, you can just say so, that's OK!) Please follow the easy 1, 2, 3 steps to winning This giveaway is open to USA residents who are 21 years of age or older. I, Janice Crespo, follow you :) These bags are awesome! Personally I like the Dad's bag in the Antique Brown. http://mrssmithsbags.com/bags.php?id=6 Thanks for the chance to win! I follow and I love the http://mrssmithsbags.com/bags.php?id=3 Tempo bag! I like the Classic Pack in antique brown vegan leather. I like this bag in pink polka dot!! My favorite is the Classic antique brown, what an awesome idea! I am a follower! (You can find me as "Amanda Davis") Were I lucky enough to win and have the choice, I would love the Classic Pack in Antique Brown Vegan Leather (http://mrssmithsbags.com/bags.php?id=6) But all of the bags are great - and so functional. I especially love the shelf!! Thanks so much for the chance to win! I follow @Tracy_Iglesias on Twitter (@amandapersists) -- Thanks again! I liked Mrs. Smith's Bags on Facebook and left a message on their wall and mentioned your blog, too! (My name is Amanda Davis) -- Thank you!! I am following MrsSmithsBags on Twitter (@amandapersists) - Thank you!! I liked Ascending Butterfly on Facebook! (Amanda Davis) - Thanks again!! I follow via Google Friends under the name Betty. I like the Basic style in solid black. I follow Ascending Butterfly. I like the Elite bag in pitch. Mrs. Smith's Basic Bag in black. I follow via google. I like the tempo polka dot bag. I love the Elite Bag in Platinum, http://mrssmithsbags.com/bags.php?id=5 . i follow @MrsSmithsBags on twitter - js22222222 . well, at least i think i do. Neither the link you gave us nor the widget on the right work - they tell me the blog does not exist. But I've entered your giveaways before and would have followed you then. I just like to double-check. I have just purchased two weeks ago the exotic in the giraffe print. This is a wonderful opportunity to try and win a bag for my husband. Thanks for the chance!! I Liked Mrs. Smith's Handbags on Facebook and wrote on their wall that Ascending Butterfly sent me.